Free from gluten, dairy, flour AND banana yet incredible tasting: these pancakes will literally change your life! 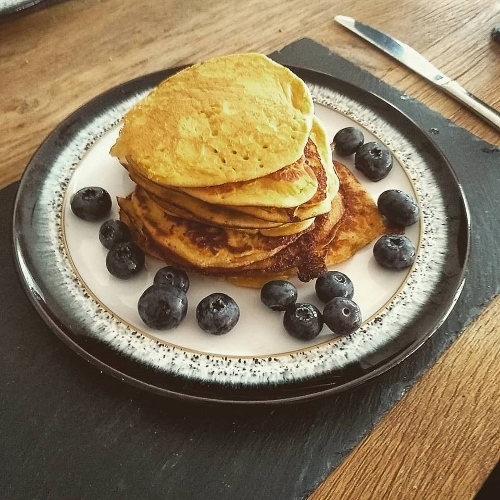 I believe it's never not a day for pancakes (apart from days when you have other stuff for breakfast...) and have previously experimented with many versions that have either taken an incredibly long time to put together or taste like there's something missing. This life-changing recipe contains no banana, gluten, dairy or refined sugar yet you'd never know coz they taste OUT OF THIS WORLD! My personal trainer clients and boot camp superstars have made me aware how much they've been looking forward to experiencing this (without any of the above ingredients) so I'm thrilled today's the day! The other side will cook much quicker so keep watch and remove when they look fluffy and wonderful. We served ours with some more coconut nectar and blueberries but use whatever you like as everything will taste pretty amazing! The almond meal, baking powder, vanilla powder and coconut nectar are all available on Amazon!